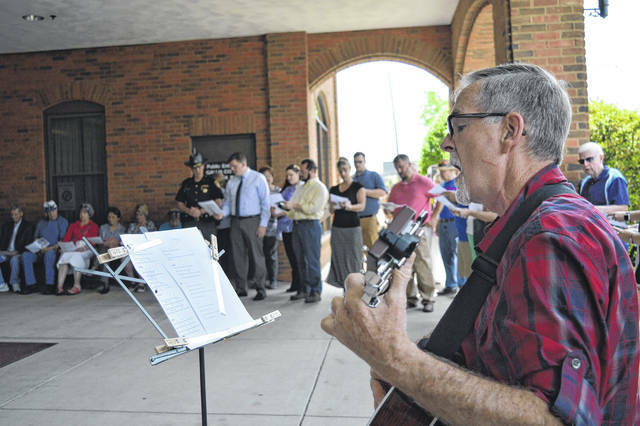 Gallia County celebrated National Day of Prayer on the Gallia Courthouse steps Thursday with song and prayer as members of the community and Gallia congregations shared fellowship together. Prayers were led by John O’Brien, Jamie Sisson, Heath Jenkins, Josh Bodimer and Barb Williams. Songs were led by John Jenkins. The theme of this year’s National Day of Prayer centered around “Unity” and Ephesians 4:3. Gallia Commissioners read a proclamation recognizing the day.